Hundreds of mourners have gathered in Oxfordshire for the funeral of the last British serviceman to have seen active duty in both world wars. William "Bill" Stone died aged 108 on 10 January at a care home in Berkshire. Mr Stone joined the Royal Navy on his birthday in 1918 and served on ships during both world wars, until 1945. Originally from Devon, he lived in Watlington, Oxfordshire, for many years and his funeral was held there at his local parish church, St Leonard's. Mr Stone was the last remaining Royal Navy veteran of World War I. In November he lead the nation's remembrance at the Cenotaph in London along with two of only three surviving fellow WWI British veterans, 112-year-old Henry Allingham and 110-year old Harry Patch. Mr Stone, whose motto was "keep going", put his longevity down to "clean living, contented mind and trust in God". 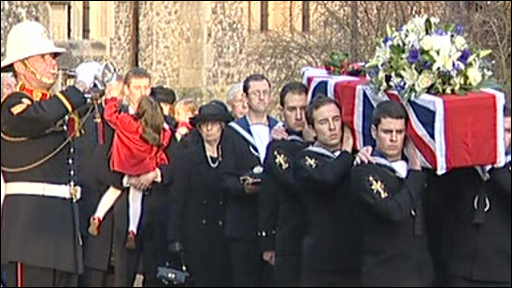 The Royal Navy and the Royal British Legion held a guard of honour as his coffin was carried into the 15th Century church by a group of serving navy stokers. His service medals - including the British War Medal, the Atlantic Star, the Africa Star and the 1939-1945 War Medal - decorated with an oak leaf for "Mentioned in Despatches" - were carried on a cushion in the funeral procession. Mr Stone was born on 23 September 1900 in Devon, the 10th of 14 children. He served as a stoker on HMS Tiger, HMS Hood and HMS Salamander and took part in the evacuation of Dunkirk in 1940, making five trips to pick up troops from the beaches. After leaving the navy he returned to Devon where he ran a barber's shop for many years. He married Lily in 1938 and they moved to Watlington in 1986 to be closer to their daughter Anne. His wife died in 1995. Mr Stone continued to take an active role in commemorative services of both world wars. In 2004 he was presented with the National Veterans' Badge. He died peacefully at the Masonic care home in Sindlesham surrounded by his family. 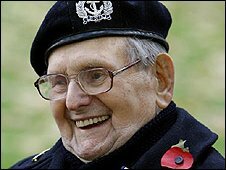 Before the funeral service, Keith Evans, of the HMS Hood Association, told the BBC: "He constantly pulled my leg and had a rather wicked sense of humour. "It was a privilege to have known Bill." A bugler played the Last Post at the end of the service before Mr Stone's body was taken to a private cremation.